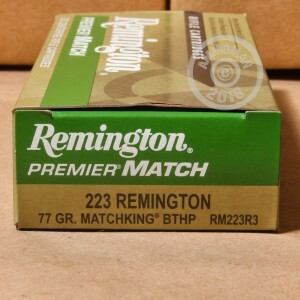 If you want to win a match, you need top quality ammo like this Remington Premier Match in .223 Remington. Ideal for AR-15s and bolt-action rifles alike, these premium cartridges deliver pinpoint accuracy that more than justifies the cost for competition shooting! Each cartridge in this box of 20 fires a heavy 77 grain Sierra MatchKing boat-tailed hollow point bullet. The MatchKing is a classic design that remains dominant due to its peerless ballistics, top-notch production quality, and real-world track record of helping many of America's finest marksmen (and markswomen) win trophies. 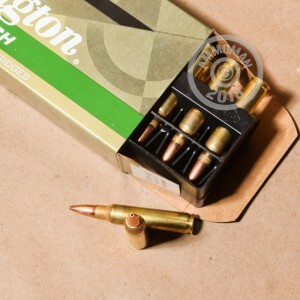 This ammunition uses non-corrosive Boxer primers and brass cases. 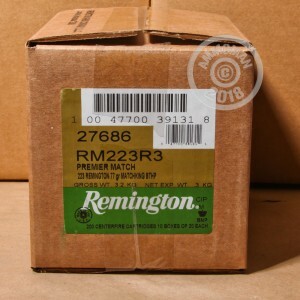 While these rounds are definitely costlier than range fodder, AmmoMan.com can help with free shipping for all orders over $99. Order today and get ready to hone your skills and become a serious contender!